On the other hand, sometimes there is not always enough oxygen, or the oxygen can't get to the fuel fast enough to keep up with the rate of the combustion reaction. This will result in fewer oxygen atoms being able to bond with the carbon atoms from the fuel, this results in the production of carbon monoxide (CO) and fine particles of carbon (C), and less heat energy. Carbon monoxide is also a colourless gas, however the fine particles of carbon can be seen as what we commonly call smoke. Incomplete combustion can be a problem in every day life because it can indicate a sign of inefficiency in machinery. For example, if your car engine produces a lot of smoke out the back of the exhaust pipe, it indicates that the engine is wasting fuel which could mean that there is a problem with the flow of air into the engine, or the engine isn't firing properly. Another situation is when metal refinery plants need to keep their furnaces very hot, thousands of degrees celcius. to melt metals such as iron and aluminium. However, if there is a lot of smoke produced by the furnace it indicates that fuel is being wasted and consequently they are not producing as much heat energy. Smoke is another sign that the air could be filled with poisonous carbon monoxide - which can't be seen, but is often a product of incomplete combustion that comes along with the carbon particles in the smoke. You can observe the difference in heat energy and smoke produced by a flame with a bunsen burner. When the collar of the bunsen burner is closed, the flame turns yellow and often deposits black soot onto the surface of any object placed above it (for example, a test tube), and is not very hot. 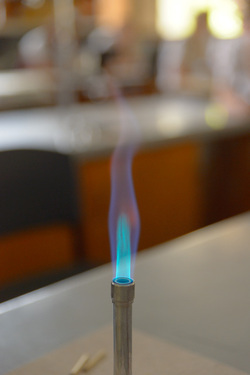 When the collar is open, to allow more oxygen to flow into the bunsen burner flame, the flame changes to a blue colour and the smoke is no longer present. This blue flame is much hotter, which is why we call it the 'working flame' sometimes because it is the most useful, and it does not deposit any soot on any objects held above the flame.